I will never forget catching Gage drag Emerson down the hallway like a caveman when she was only two weeks old. He had snuck in the twin’s bedroom and grabbed Emerson with a barbaric clutch from her bouncey seat. After my initial frantic reaction, I figured infants are far less fragile thank we think. I still installed a hook-and-eye lock to the bedroom door to prevent further attacks. Anyway, the personalities of Gage and Emerson don’t necessarily ‘click’ all of the time. He simply prefers Campbell more. However, a friend of ours invited Campbell to her house for a few hours last week. The switch in family dynamics was instantaneous. On top of that, our house was noticeably more quiet! Moments after Campbell departed, Emerson and Gage were buddies! 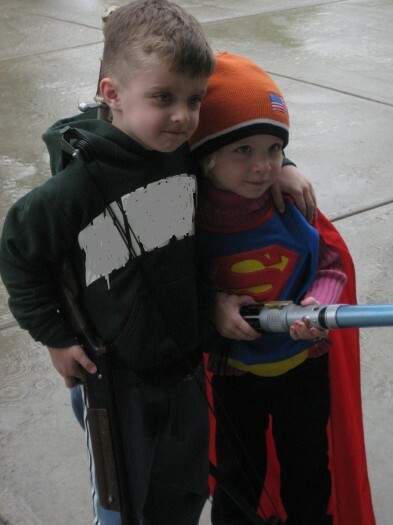 They got dressed up in superhero gear, decided to play outside in the rain, and fight bad guys. There played wonderfully together. It made me consider the power of family dynamics. Remove one child and the household is entirely different. I was so glad to see that these two may be unlikely pals but buddies, nonetheless.